With drones becoming increasingly prevalent in Dubai’s skies, more and more skilled flying professionals and drone hobbyists are becoming enthused at what the future may hold for drone services in the UAE. What has become clear is that drones represent a force for social good – enhancing our lives by making the previously inaccessible, accessible. What does this look like? As it turns out, there’s more than a handful of ways that drones can elevate existing services. Once you begin to think about it, the possibilities are not far from being endless. We’re all aware of how drone video services in Dubai can add a bespoke element to brand marketing campaigns, attracting existing and prospective clients with visuals that are as immersive as they are attention-grabbing, but leading reports have concluded that drones can be used to across different sectors propelling social awareness, whilst improving on existing services. When faced with a medical emergency, timing is crucial. In the most serious of circumstances, it can be the difference between life and death. However, what if you need to quickly survey a vast geographical area? Enter drones. Aerial photography can quickly access if a patient is in critical condition and carve out a route for emergency services to reach patients quickly. Should injured parties be unaware of their surroundings, medical professionals, or those fully-trained in drone aerial photography or videography can survey the area and form an action plan for reaching and delivering the necessary medical help. That’s not the only aspect of the medical profession that can benefit from drone technology. There’s also another aspect of medical processes that drones can drastically improve. What if you need to get vital equipment and supplies to an area which cannot be reached with conventional transportation? Enter drones. With the ability to carry light payloads of up to a few kilos for notable distances, drones can be a lifesaver for medical delivery. Let’s say that you have a medical emergency. You have a diabetes patient who desperately needs insulin and you cannot reach them? Medical professionals can equip drones with insulin, an EpiPen and additional medical supplies to successfully administer insulin in a sanitary manner. In addition, medical professionals can use drones to transport medical supplies between facilities with ease. From blood cultures to specialised smaller equipment, drones can offer so much more to the medical profession than merely being used for aerial photography across the seven Emirs. As with medical emergencies, what if fire services are unable to reach or view the severity of an outbreak of fire? Enter drones. Research has also concluded that drones in the UAE have the potential to positively affect fire response times and procedure activities of departments across the Emirates. Using aerial photography and videography, drones can deliver HD pictures to support emergency call handlers and fire commanders on the ground. This can allow them to arrive on the scene faster, allowing them to contain the spread of fire quicker. A more efficient and safe response plan can also be devised negating potentially perilous situations before they arise and securing the safety of any victims and trained fire response professionals. Animal conservation and scientific professionals consistently strive to gather data that allows them to better understand the world and all the animals that dwell within it. Sadly, their observations can often be obscured. Enter drones. In 2017, researchers at Oregon State University’s Marine Mammal Institute captured rare aerial footage of blue whale’s lunge-feeding on the krill. Drone aerial photography allowed researchers to gain a new perspective on the action. This allowed them to identify which patches of the krill whales deem to be viable based on the amount of energy they need to exert and the degree of nutrition. Not only that, ecologists have also used drones to monitor and track critically endangered birds, count sea lions and even help the dwindling population of the southern right whale to recover after consistent whaling all but eradicated these majestic mammals. The UAE isn’t the only territory around the globe to use drone video services and more innovative services, to improve the lives of residents. China – a country infamous for its smog levels and suffocating air pollution decided to take drastic measures to secure the health of the population in some cities. Enter drones. Created by the Aviation Industry Corp of China, drones equipped with a gliding parachute and equipped with a chemical catalyst designed to cut through the smog and create artificial wind currents, reducing air pollution. Such was the success of the experiment, China’s Ministry of Environmental Protection launched a series of drones to detect illegal night-time factory emissions, monitor waste dump sites and areas of natural beauty to make sure that the population was observing China’s strict sanitation laws to great success. It should come as no surprise that global reports have highlighted the importance of drone development focusing on benefiting society. Does this mean that we’re about to see drone video services in Dubai deployed for increasingly social-conscious reasons? Only time will tell, but one fact is assured: drones can greatly benefit society in the UAE. 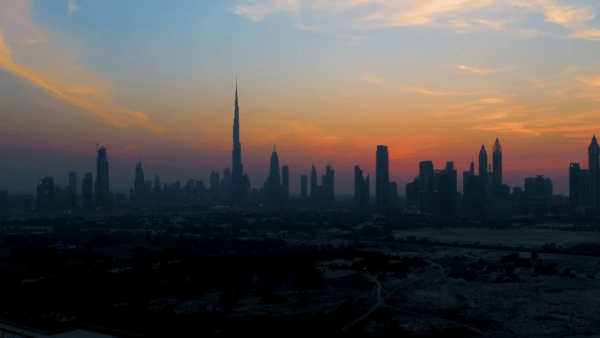 Sky Vision is a visionary drone video production company in Dubai. Our ethos is rooted in our love of drone video production. It’s this passion, along with our vast technical acumen that we bring to every project, that has seen our business soar. We give our clients the opportunity to enjoy breath-taking aerial videography of Dubai for a fraction of the cost of hiring a professional filming crew. We are fully-qualified and highly experienced and are positioned as one of the best drone companies in Dubai. Already servicing a wealth of SME and blue-chip clients in UAE, we are consistently striving to improve our services which is why we are setting new standards for creating affordable, yet stunning aerial content.